Agriculture has been a part of Andrew Lauver’s life since his upbringing in Lake City, Iowa. Now this second-year student at Drake University Law School is helping advocate for Iowa’s agriculture industry. “Since I was three years old, I wanted to be one thing—I wanted to be like my dad,” Lauver says. Lauver’s father owns Lauver Family Farms, a fifth-generation corn, soybean, and cattle farm on which Lauver worked throughout his childhood. Since 2012, Lauver has served as farm manager, a position that involves planting, harvesting, operations, and more. Inspired by his passion for farming, Lauver obtained his Bachelor of Science in Agricultural Studies from Iowa State University and a Master of Agribusiness from Kansas State University. Later, the same interests persuaded him to attend Drake Law School. Since enrolling in law school, Lauver has built experience on the legal side of the agriculture industry. 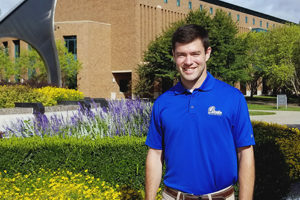 This summer, he worked as a government and regulatory affairs intern for the American Seed Trade Association (ASTA) in Washington, D.C., drafting legal and economic analysis on agricultural topics. While at the ASTA, Lauver’s economic analysis on gene editing was shared with the White House National Economic Council staff. He studied food safety and the Farm Bill, and he supported efforts to align policies within the U.S. Department of Agriculture, U.S. Food and Drug Administration, and U.S. Environmental Protection Agency. This semester, in addition to his classes, Lauver works as the industry relations manager for Syngenta. His responsibilities include managing key commodity and grower group relationships, developing strategies for investment in industry associations, and building engagement with Syngenta customers and other stakeholders. Lauver attributes his professional success in agricultural law to his classroom preparation, as well as his farming background. Lauver’s dedication to agriculture has been recognized with numerous accolades, including the New Leader Award from the Iowa Soybean Association and the Emerging Iowa Leader Award from Iowa State College of Agriculture and Life Sciences. He was also named a “Future Giant of the Seed Industry” by Seed World Magazine and Future Seed Executives in 2013. Lauver has big plans for the future. He is newly engaged to Mary Francque, a fellow Drake Law student. He also plans to pursue his passion for agricultural policy after law school. Having worked in all areas of the agriculture industry, Lauver says he found an intersection at Syngenta. “As with everything in life, the decision comes down to what excites you. For me, that’s agricultural policy,” Lauver says.